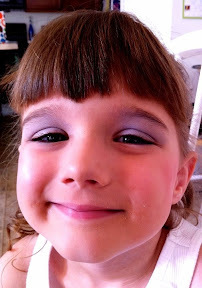 For Alyce's recital she needed to have her hair and makeup done. Leading up to the rehearsal Mom wanted to do a trial run. 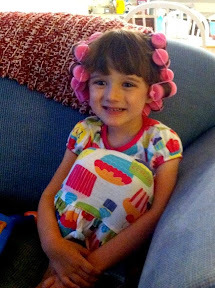 Mom picked up some curlers from the store and set to work. 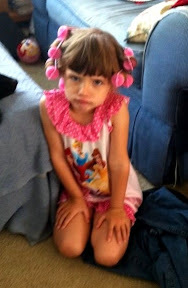 The first attempt at Alyce's hair didn't go so well. The finished product seemed ok but Alyce wasn't too happy with the steps needed to get there. The day before the rehearsal Mom tried again and Alyce was a much happier participant. She even went to bed to bed with her hair up. The day of the rehearsal Mom applied Alyce's makeup. Alyce was very into this and did a good job sitting on the stool as Mom went to work. Alyce was very pleased with the final result. It was cute seeing her all gussied up but I'll take my little girl any day. 0 comments on "Hair & Makeup"